I am going to share the secrets tricks for how to get Google AdSense approval fast. I am not much successful in blogging till now and still I am a newbie and i have just started this blog, (in January 2013) and getting approval for "AdSense Account" in Just couple of months. So just wanted to share experience as how I got approval for AdSense for a two month old domain, and only (twenty) posts at the time of approval AdSense. almost all the bloggers are having their custom domain. get a custom domain for your website/blog and you get (Dot com) domain name more than $1 only. You can check How to select a best domain name for your blog. i get my domain name to (GoDaddy.com) because this is easy to use. This method also effect in the (AdSense Account) approval process. If you read our previous article on "What Domain Name To Choose" you must have read a point to need of top level domain. We should use top level domain like .com or .org. Domain age are always plays a very important role in "AdSense" approval process if you live in Asian Subcontinent countries. your domain age should be minimum of 6 month old, in AdSense policy. but i think a domain with age one and half month is sufficient for the AdSense approval. blog layout design is also an important step in approval AdSense approval process. get your blog a professional look layout. this will also attract readers as well as advertiser on your blog. You can check my article on How To Select a Perfect Blogger Blog Design. There are so many templates available on the internet free of cost. This helps in making site more users friendly. and you easily get AdSense Account. This is the most common question a newbie blogger ask before applying to the AdSense. How much traffic really it needed to get approval? my experience and what I read about this till now is 150 to 200 page view is Good to apply for AdSense account. and 200 daily page views are not too much you can also get real, or target traffic to social media sites, or blog promotion or even blog commenting method to get this much traffic. Handsome amount of blog post,s for approval is 30 to 35. but many bloggers have received approval with even 12 to 13 post. plenty number of bloggers who are still getting rejected with more then 100 posts. so be relax and write good post. if people like your post, you get more chance to approval. It,s always advisable to write a long blog post and not to write a blog with less than 450 words. always write Quality content of article. and never copy anyone,s article else Google will detect easily and can reject your application. So always try to write quality article and try to have at least 400 to 450 words in each article. Google or any other search engines love lengthy and unique blog posts. always use your common sense to write your good article. I would suggest you just reading, Google AdSense policy before applying to it. and this contains almost all the points that we covered above. Whenever AdSense reject your application, they send the reason for this. You will get an email explaining why your application got rejected. Common reasons are many application are reject is, like "not having enough content" So work on the reason they provided and apply again when you solve this issue. So simply work on the reason and apply again, and finely you get success. Hope this post will help you in getting AdSense approval. 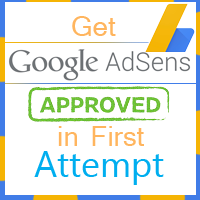 share your awesome "tricks" on getting approval AdSense. If you like my post, so please sharing this on your social sites. and also on your blog. Please Check the My Blog, can my blog adsense approved? your blog is good but not good enough for Adsense approval. Add read more links to your blogs, choose a custom template with a good layout (Ad ready). Well but your SEO rankings are too good, just follow up these steps and get approval 100%. Also, remove the custom re-direction from the blog i.e. .in to .com because google gives you more earnings from USA than any other country. Check it all below! Awesome..thank you very much for share really I like your post keep in touch from Indonesia. trying to get adsense approval for my blog which deals with customer contact numbers..Hope your inputs will help me in getting adsense .. Thanks a lot for sharing your useful informative blog with us. this is really helpful for me in gaining my knowledge in a right way. It's very worth saying,i am amazed.I really appreciate the kind words,Thank goodness someone is promoting quality content.more new skills to develop after reading that post. visit and plz share your opinion..!! I do believe that getting approval from the Adsense is getting really easy in comparison of the early days but thats no same the bloggers from the Asia origin. There are number of terms and conditions to be followed for the Asian origin bloggers. You did marvelous job and these tips are to be followed to get approved. At last, Congratulations for the approval from the Adsense, Happy Earning Dude !!! Thanks for sharing this much of information. If anyone looking for seo services in Hyderabad, Quuick provide seo services in Hyderabad. DreamHost is the best website hosting provider with plans for any hosting requirements. "Hello there! This is my first comment here, so I just wanted to give a quick shout out and say I genuinely enjoy reading your articles. Can you recommend any other blogs/websites/forums that deal with the same subjects? Thanks.